Great first time Nitro kit! 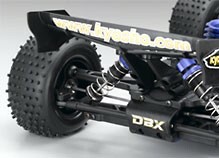 The Kyosho DBX Readyset 1/10th nitro buggy is a great starter kit for a new RC hobbiest. This kits is extremely tough and durable as well as inexpensive to fix and simple to repair. You will need to get a glow igniter as well as a fuel bottle to get it going going. 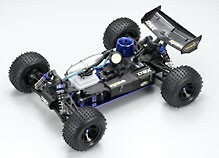 Closer in size to the 1/8 INFERNO than existing 1/10 GP buggies, this advanced chassis design promises real racing performance while still being easy to drive. The stable handling lets you power through the dirt even on 1/8 buggy racing circuits and takes on big jumps without missing a beat. With running power that pushes the boundaries of common sense for a 1/10 class machine, you can turn local open space into your own private rough road race track. The deep stroke 4-wheel independent suspension and full-time 4WD drive-train powered by the 18-size engine means nothing can stand in your way. Fully-factory assembled and in a Readyset package for instant off-road excitement. Center shaft drive 4WD low CG chassis with three differentials. Equipped with digital servos for great response. Dirt-proof radio box protects the receiver and battery box. Can be attached or removed from the chassis with just four screws. Long span suspension arms create the wide tread on the double wishbone 4-wheel independent suspension system for superior running stability. 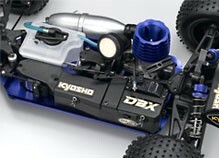 GXR18 engine mounted on 1/10 chassis that is normally seen with 12-15 size engines. Equipped with recoil starter, large cylinder head and tuned type muffler. 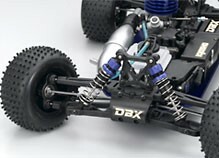 Front / rear and left / right suspension arms, front / rear knuckles and front / rear shock stays are all interchangeable. Newly designed suspension with maintenance-friendly ball connect system. Includes newly designed 105cc fuel tank to supply the large 18-size engine. Delivers stable fuel supply even under severe driving conditions. Can deliver run times of more than 10 minutes. Equipped with large capacity oil shocks as standard. Soaks up bumps with ease and secures smooth jump landings. Features dial adjustable chassis height setting. Brake disks are equipped in the front and back of the center differentials providing reliable braking power. Enables separate adjustment and setting of front and rear brakes. Pre-cut body features sharp 6-color printed color scheme. Combines with the aerodynamic curved surfaces of the large wing to generate strong down-force. Design features multi-point setting adjustments such as chassis height, camber, tread, front and rear toe-in etc. Pin-spike tires with inner sponge supports are fixed to wheels with on 5mm axles with aluminum wheel nuts. Compatible with tires sold in the general market.